Pro-gesang.de freut sich, euch das erste aller 4-3-2-1-Events anzukündigen!! Phonation, schlicht alle mit dem Gesang zusammenhängenden Themen so zu vermitteln, dass der Sänger aus diesem Wissen alle Möglichkeiten hat, den für Ihn besten Weg zu gehen. Durch Jahrzehntelange Erfahrung mit den verschiedensten Konzepten, Techniken, Lehrern und Coaches haben wir ein wirklich breites Wissen und natürlich auch die Anwendung aufgrund echter Live-Erfahrungswerte parat und können dies auch vermitteln. Was passiert an dem Oberklasse-Event? An diesem Wochenende werden wir einen ganzen Tag Wissen über Anatomie, Phonation, verschiedenste Techniken, Methodik und wirklich umfassend die fundierte Sichtweise von thevocaliststudio.com durch den Gründer persönlich, Robert Lunte, erfahren. Praktische Übungen und die direkte Anwendung sind selbstverständlich. Robert tourt mit dem &bdquo;Four Pillars of Singing“- Event zu dieser Zeit durch Europa´s Universitäten, daher sind wir dankbar, dass er auch bei uns Halt macht. Mehr von Robert unten in seinem persönlichen Text oder auf www.thevocaliststudio.com. Hanna ist zertifizierte Atem-, Sprech- und Stimmtherapeutin sowie im klassischen Gesang ausgebildet. Sie lehrt uns die Zusammenhänge von Körper und Stimme verstehen, Atmung und Bewegung zu harmonisieren und einen individuellen Stimmausdruck mit einer deutlichen und verständlichen Aussprache auf Stimmgesunde Weise zu verwirklichen. Mit Sympathie und Spass am Singen wird Hanna Gesang erläutern, demonstrieren und natürlich auch anwenden lassen. Mehr über Hanna auf www.pro-gesang.de. Tamara spricht über Bühnenangst und verwandte Themen, als Lehrkraft für Psychologie, Stressmanagement-Trainerin und erfahrene Sängerin weiß Sie, wovon Sie spricht und wie man erfolgreich damit umgeht. Mit praktischen Tipps und Übungen weg von der Angst hin zum Spaß beim Singen auf der Bühne! Sascha spricht über die gesanglichen Möglichkeiten, die in wirklich jedem von uns stecken, erläutert verschiedenste Arten zu singen (von Pop bis Growl, Rock bis Distortion), verbunden mit anwendbaren Übungen. Tipps, Tricks und Erfahrungen für den Live-Auftritt runden die Veranstaltung ab. Mehr über Sascha auf www.pro-gesang.de. Im Anschluss an diesen Workshop können selbstverständlich Einzelstunden bei den Coaches deiner Wahl gebucht werden, auch eine Nachbetreuung für weiterführende Fragen ist gegeben. Für die Teilnahme am Workshop wie auch die Teilnahme an Einzelstunden erhaltet Ihr selbstverständlich ein Zertifikat. Der Workshop findet in Ansbach / Mittelfranken statt. Genaue Anfahrt sowie Uhrzeiten werden nach Buchung persönlich bekanntgegeben. Für Rückfragen stehen wir gerne unter [email protected] zur Verfügung. The first 10 students to sign up and participate in the Vocalist Studio Masterclass receives a free Performer Kit Wireless Microphone and Receiver, courtesy of our sponsor, RØDE Microphones. NO need to wait: sing better, sound better. 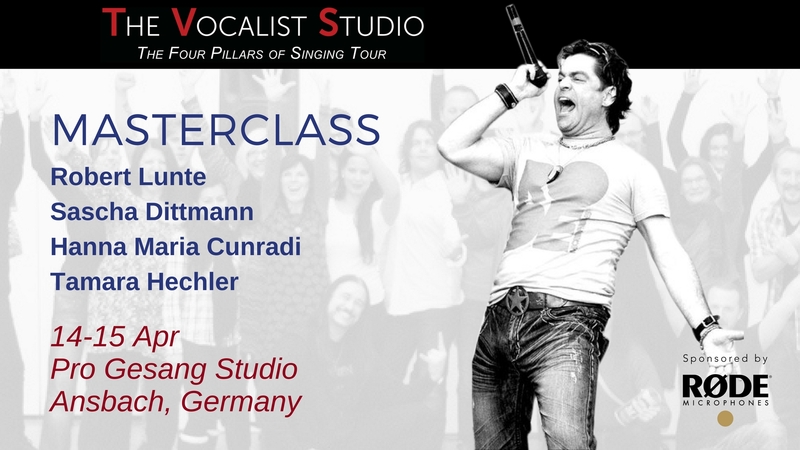 The Four Pillars of Singing Master Class is an event for any individual who seeks to learn a proven method, The TVS Method, for training and freeing their voice to become a better singer. Robert Lunte, creator of The TVS Method, has trained thousands of vocalist across US, UK, Italy, France, Germany, and Switzerland. Attendees can expect a fun, humorous and high-energy event that not only demonstrates the effectiveness of the TVS vocal training techniques, but attendees will also have an opportunity to experience first-hand the success of trying these techniques under the supervision of Robert Lunte. Attendees will be given invaluable information on vocal health, presentation techniques and instructions on how to use the techniques to warm up, amplify and animate the voice for singing. All attendees are given information that they can take with them after the event that will enable them to apply the TVS techniques to their vocal training. The TVS Method gives results. Here’s what you can accomplish using The TVS Method. Bridge your chest & head voice seamlessly for incredible range and gain freedom from strain. Never again, have any problems with pushing, squeezing or limited vocal range. Learn how to control and tune the acoustics of your singing; vowel modification, resonance and formants. Learn vocal modes; physical and acoustic vocal modes. Twang, Sob, Distortion, vocal fry. Learn how to use TVS Onsets;this is one of the most important innovations from Robert Lunte. It helps singers and teachers isolate vocal motor skills, build strength and fix problems in the shortest amount of time. Train with TVS Training Work Flows, step by step training routines that make training efficient and easier to understand. SPECIAL OFFER: The first 10 people who sign up and participate in The Masterclass receive a free Performer Kit Wireless Microphone and Receiver, courtesy of our sponsor, RøDE Microphones. Robert Lunte is available for private 1-on-1 lessons (1hr) following the MASTERCLASS in Ansbach. Take your vocal training to a new level. We invite you to book a private vocal lesson with Maestro Robert Lunte, founder of the TVS vocal training methodology and author of “The Four Pillars of Singing”. He will be staying 1-2 days after the event to offer students private 1-on-1 lessons. TVS Methodology focuses quickly and effectively on teaching students the skills to seamlessly bridge the vocal break and sing high notes with convincing, full tone. TVS is recognized as the world leader in developing techniques and training routines for these two highly sought after skills. Robert creates personalized lessons that address the skills you need no matter what level of vocalist you are. Through vocal warm-ups and song coaching students experience the application of the TVS techniques and walk away with techniques that transfer their singing forever. Robert is the owner and founder of The Vocalist Studio (TVS) and author and producer of the acclaimed vocal instruction training course and book, “The Four Pillars of Singing”. Robert Lunte helps singers and voice teachers learn how to build strength, motor skills and coordination that takes their vocal and performance skills to the next level using the highly acclaimed TVS method. Vocal coaches and students who attend Robert’s trainings learn a proven methodology, which gives them the knowledge and skills to offer or sustain an effective and successful singing voice and training practice. www.TheVocalistStudio.com. Robert is also the founder of The Modern Vocalist World, the #1 online resource for vocal education and networking on the Internet. www.TheModernVocalistWorld.com. ONE-TIME PAYMENT = LIFETIME ACCESS! Download Files & Online Streaming. - A 616 page hardcopy book will be personally signed by Robert Lunte and shipped to you. Includes an eBook. - 170+ lesson course w/quizzes to measure your progress. - 500+ videos & audio training content. - 62 workouts in slow, medium & fast speed. - Specialized workouts for men & women. - Step by step instructions that teach you HOW to train. - Real-Time chat enables you to contact Robert Lunte for support. - 14 day money back guarantee on the online course, not the book..
© 2019 BrightStar Live Events on behalf of The Vocalist Studio Euro. All sales are final. Tickets are non-refundable.